Grado iGe review | What Hi-Fi? It may seem somewhat overdue for a headphone brand only to begin to consider smartphone listening in 2016. Naive, even. But then Grado’s history in pricey open-back over ears hasn’t exactly lent itself to on-the-go markets. Better late than never though, and the Grado iGe are the company’s first in-ear headphones with a “Made for iPhone” inline mic and music controls. 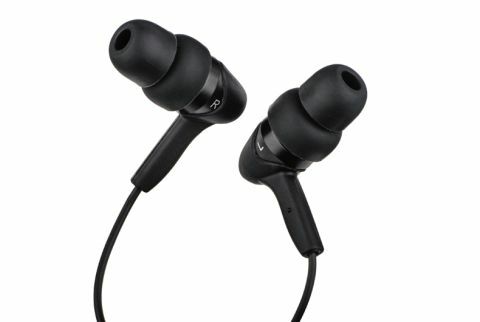 They sit at the entry level to the company’s bijou in-ear offerings, and replace the previous five-star iGi buds that we tested back in 2012. Grado says it has improved the driver response in this model, but the design remains very similar indeed, with a rubbery softly-pointed outer casing that’s easy to grip for good in-ear placement. There are four silicone ear tips in the box, S, M, L and XL, so be sure to try them all out to get the best fit. The cable is decently long and flexible, while the three-button inline remote feels sturdy enough to take any amount of clicking. It works to control volume and playback/call answer on Apple devices – Android devices will have to make do with more limited playback controls. Their sound is one we’re used to hearing from Grado, with an open and expressive character that’s upfront and exciting. Presentation sits on the bright side of neutral, with enough bite to keep drum snares on their toes and enough attack in the mids and highs for a fast, agile performance. The space afforded to instruments and voices is impressive, and there’s enough scale so big orchestral pieces, like Hans Zimmer’s The Red Capes Are Coming from the Batman v Superman: Dawn of Justice soundtrack, are able to rise and fall with conviction. These dynamic shifts are followed and articulated with precision too, with an adept rhythmic knowhow that keeps even DJ Shadow’s Bergschrund well timed and tightly organised. Detail levels are good too, with a clear and transparent midrange that uncovers all the sass and attitude in Erykah Badu’s vocal on Bag Lady. We would like to hear more from the bass in the mix though. What’s there is controlled and agile, but the balance is tipped away from it a touch too much. Luckily it doesn’t make the Grado iGe sound thin or unsubstantial, but we do find them harder work over long periods of listening. That bright signature can lack refinement and sound a little on the coarse side, particularly with electronic sounds and female voices. There is still much to love about the Grado iGe in-ears, but a better balance would make them superb. We have to dock them a star for that reason, but if you prefer your in-ears on the brighter side, these deserve serious consideration.